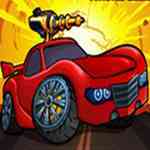 Amazing car action with tons of catchy graphic and cool gameplay. Drive a car and fly through hordes of other monster cars to escape. As always, Have Fun.